This beach resort features a swimming pool, onsite restaurant, a fitness center, tennis courts and more. Offering full or partial ocean views in most rooms, this hotel also provides free "Breakfast-on-the-Beach" daily. Located two blocks from Waikiki Beach, this 660 room hotel offers a swimming pool with sun deck and full bar. This 327 room hotel features an IHOP restaurant in lobby and complimentary wireless internet. This airport hotel offers a swimming pool with sundeck and a complimentary continental breakfast. The Trump International Hotel Waikiki is a beachfront hotel featuring a sixth-floor waterfall and infinity pool. Located on Waikiki Beach, this 837 room hotel features a three story aquarium viewable in the hotel's restaurants. Located next to the 500-acre Kapiolani Park, this 125 room hotel features private lanais and two restaurants. Located across from the area known as Kuhio Beach, this resort was renovated in 2008. Located one block from Waikiki Beach, this hotel features two pools, a sun deck and spectacular ocean views. The area's most competitive, modestly-priced hotel accommodation on Kuhio Avenue. A 358-room hotel one block from Waikiki Beach and overlooking the Pacific with private balconies and a poolside bar. Condominium-style hotel with large rooms located in the heart of Waikiki with a heated pool, sauna, and fitness center. 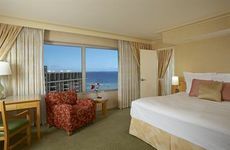 Waikiki hotel with rooms and suites featuring private balconies and a pool close to the beach, shopping and attractions.